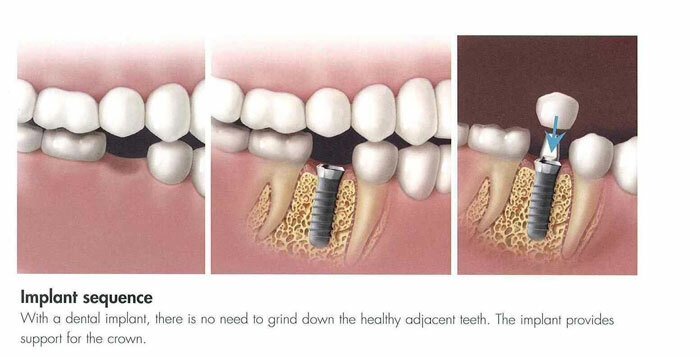 Dental Implants are the standard of care when it comes to replacing missing or extracted teeth. Whether you’re missing one tooth or all your teeth, dental implants provide options that are most like natural teeth. Dental Implants can support more than just single teeth. Patient’s can have an entire set of teeth held in by several implants; these prostheses are called implant-supported dentures. Implant supported dentures are secured in place by minimum two or more dental implants by attachments that connect to the implant. The attachments allow you to have control over when your teeth are removed for easy daily care. Help preserve your oral bone and natural facial contours. A bridge can be the best solution for multiple missing teeth. They are made of high-quality, durable materials and are anchored on each side with a crown. A bridge will take care of the gap in the appearance of your smile and return your chewing capabilities to full functionality. The most basic and original way to replace several missing or all teeth is with a partial or complete denture. Partial dentures are held into place by surrounding teeth. Full dentures are held into place by underlying soft tissue and many patients require the use of denture adhesive to keep their dentures in place.